Accueil » News » Domotique » La fin des SMS sur la Vera ? Au cours des divers guides réalisés sur la Vera, nous avons évoqué l’utilisation des notifications par SMS, gratuites jusqu’ici. Your current notification settings are showing that you are not using a carrier for sms notification. Most mobile carriers allow us to send you text messages for free by sending the text message within an email. 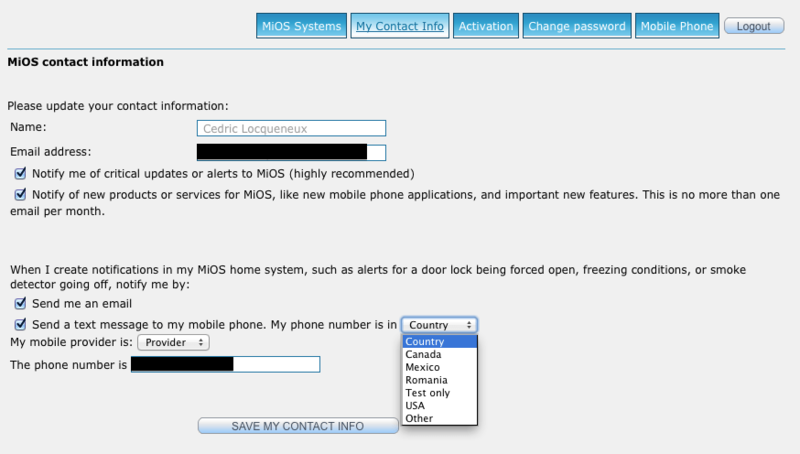 To check / modify your notification settings, please go to https://cp.mios.com, log in with your account information, go to ‘My Contact Info’ tab, select your Country / mobile provider combination and enter your phone number in the respective text field. If your country and carrier are selected, you will be able to set the notification limits to any value you want. Otherwise, if you choose « Other » for your carrier, we have to send the text messages using an email to sms portal, which translates into (up to) 25 cents per text message so we are forced to limit the number of text messages to 1 per day. We suggest that you call your carrier and ask if there is a way to receive text messages by email. Most carriers provide this service. Once you get the correct email address to use for text messages, send an email to support [at] micasaverde.com with the subject « Text message email », and include in the email your country, the name of your carrier, and the email address to send text messages to. We will add your carrier to the list so that you can have unlimited text messages. If in 30 days you will not update your account with a carrier that allows you to get text messages by email, we will apply the current policy of one notification per day to your account also. Grâce à ces deux guides, vous pourrez continuer de recevoir des notifications sur votre téléphone. Sinon, les notifications par mail continuent bien sûr de fonctionner sans condition.